March 14th, 2013 - Toyota Material Handling, U.S.A., Inc. (TMHU), the supplier of the number one selling lift truck in North America, announced the extension of the company's philanthropic efforts to help the country's veterans by donating tovarious veterans programs. As TMHU continues to offer the "Giving Veterans a Lift" program through the end of this year, the company is committed to programs that help veterans transition to civilian life. To date, TMHU has donated $5,000 to the Wounded Warrior Project, an organization that provides programs and services to meet the needs of injured service members. The company also donated $2,000 to Fisher House, a program that provides "comfort homes" built on the grounds of major military and Veteran Affairs medical centers to enable family members to be close to aloved one during hospitalization. Another $1,500 was donated to Project Heal through ECAD, Educated Canines Assisting with Disabilities. The program provides veterans with physical and psychiatricinjuries with service dogs. In addition, several Toyota associates have donated money, items and time for veterans at the VA Long Beach Healthcare System in Long Beach, Calif.
"We are proud that our associates also are committed to helping our country's finest and that our support is growing through donations to these additional veterans groups," said Jeff Rufener, president of TMHU. "Toyota hopes these efforts, and the 'Giving Veterans a Lift' programs, will help many more veterans." TMHU's "Giving Veterans a Lift" program offers veterans discounted operator safety training to become certified forklift operators. Another element of the program includes assisting Toyota's dealers in recruiting qualified service technicians, while at the same time providing veterans with employment. Veterans are encouraged to apply for Toyota Industrial Equipment (TIE) dealership service technician career opportunities at toyotalifttech.com. For every veteran hired by a TIE dealer as a service technician, TMHU will match a dealer's donation (up to $500) to Hire Heroes USA, in honor of the newly hired veteran. Hire Heroes USA (HHUSA) is a nonprofit organization dedicated to creating job opportunities for U.S. military transitioning service members, veterans and their spouses. The services provide in transition and job search assistance, and job placement services, to those who have served in the U.S. military and to their spouses. Toyota offers a veteran operator safety training (OST) program, which was originally launched in 2011, and provides a $200 discount on forklift OST forveterans. This program is available through December 31, 2013 via Toyota's network of participating dealers. 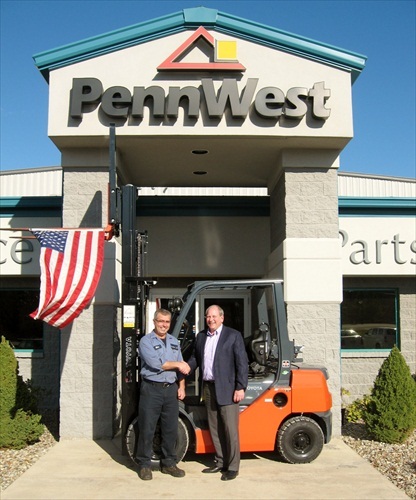 To learn more about the "Giving a Veterans a Lift" program and the OST program, visit http://www.toyotaforklift.com/pages/training/veterans.aspx.